Published: Feb. 15, 2013 at 09:05 a.m. 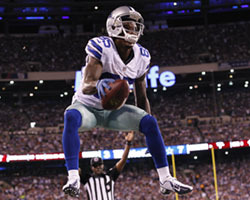 Updated: Feb. 15, 2013 at 01:10 p.m.
One of the biggest challenges the Dallas Cowboys face as they spin forward is fixing their running game. Coach Jason Garrett was criticized for his lack of committment to the run in 2012, though it didn't help that running back DeMarco Murray was never the same player after suffering a foot injury that cost him six games. The Cowboys ran for just 1,265 rushing yards as a team, a franchise-worst figure over a 16-game season. It led to the firing of running backs coach Skip Peete, who was replaced by Gary Brown. Officially added to the staff on Monday, Brown believes Murray can be a star in his third season. "I believe so," Brown said, via The Dallas Morning News. "We all know that the injury bug has bit him a little bit. We have to keep him healthy, and he and I will work together to just refine some of his things and get him better. Obviously he is a good, talented runner. We just want to shine up some of his things and get him to be an elite runner." Expect a shake-up on the depth chart after Murray. Felix Jones is a free agent who's likely run out of chances to prove himself. Brown hinted that the Cowboys will pursue a player with a different style than Murray. "You probably just want a guy that's going to come in and complement him in the way maybe of just being, maybe more of a jitterbug type guy," Brown said. "It's hard to say. I've only been here a few days." This is an important year for Murray, who needs to stay healthy if he wants to prove himself to be a bell-cow type back. If Murray goes down again, part of Brown's job will be finding out a way to keep the running game moving.